Think small for big results – the Troy Barbells 12 Sided Urethane Encased Dumbbell Set with Chrome Straight Handle – 5-100 lbs. has one of the compact designs on the market. Its 34-millimeter chrome-finished handles won’t flake or peel, and they’re press fit completely through the steel slug then welded on the outside. The no-odor urethane heads keep floors and equipment protected, while the 12-sided design helps prevent rolling. The set included 40 dumbbells – one pair each of 5-100-pound dumbbells in 5-pound increments. Troy Barbell's 12 sided urethane solid steel dumbbell incorporates a unique looking anti roll feature. Call 1-800-875-9145 to speak with one of our fitness advisors with any questions you may have about any of our dumbbells or Order your Troy 12 Sided Urethane Dumbbell Set 5-100lbs TSD-005-0100U from FitnessZone.com today! 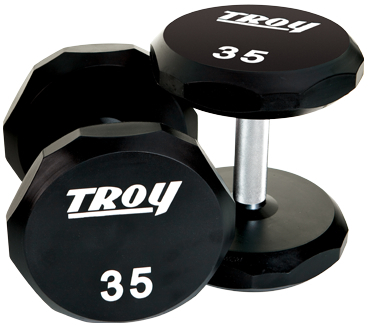 Order your Troy 12 Sided Urethane Dumbbell Set 5-100lb Set from FitnessZone.com today!